Ophelia walks slowly across the living room to the kitchen. She gives me that stare that says, ‘œFeed me now!’ So I open a new can of food a different flavor than yesterday’s food, which she decided she no longer likes and put it in front of her. A cursory sniff and she starts to walk off, then comes back and glares at me again. ‘œDon’t tell me that’s all you have?’ she seems to say. So I heat her food in the microwave, stir it up, and try again. This time she takes a tentative lick at it and eats about three or four mouthfuls, than slinks off on arthritic limbs to curl up on her heating pad, which is where she spends about 23 hours a day. Ophelia is my sick, old, cranky cat. When I found her as a feral they guessed she was 11 months old, but my current veterinarian thinks they underestimated by several years, possibly because she’s so small. She tested positive for feline leukemia (FELV), so I knew no one else would want her (not to mention the cranky part, which was more pronounced in her immediate post-feral days). So I took her in, and we’ve had a wonderful love/cranky relationship for the past nine years. But about a year ago Ophelia started throwing up a lot and becoming really picky with her food. We ran every test under the sun and they all turned out great, with the exception of a minor heart murmur (we went to the kitty cardiologist to get that checked out, and $1,000+ later he assured us that her other health issues would catch up to her before her heart gave out). So with a tentative diagnosis of irritated bowel disease or lymphoma, we started to play the ‘œwait-and-see’ game to watch for any changes that would give us a better indication of what was going on. 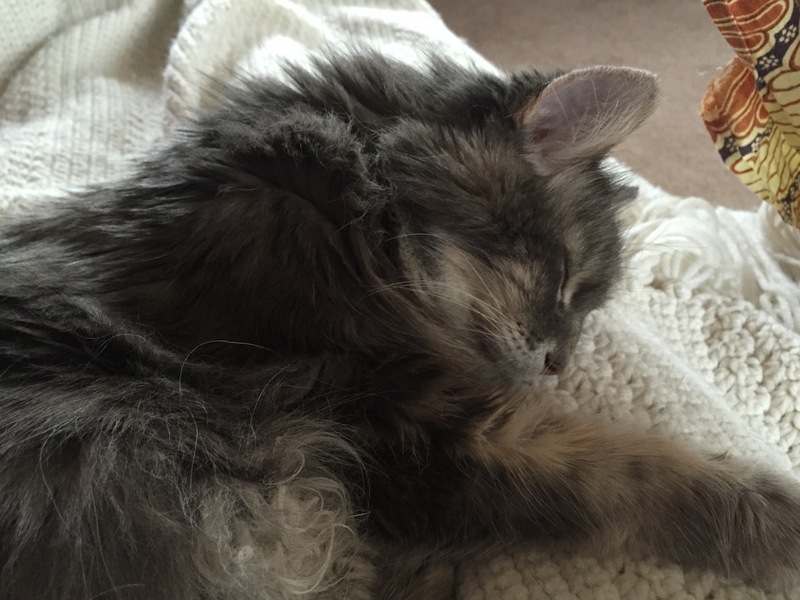 I kept buying different kinds of foods and finally found that a grain-free canned food seemed to help the throwing up, but she still couldn’t eat too much at a time so she had to eat frequently. I found myself getting up two to three times a night to feed her. I’ve been pretty tired for the past year. Maybe because it’s been so slow I haven’t noticed it, but she seems to be eating less and less, and at her last annual exam she’d lost another half a pound (she was only six and a half pounds to begin with). So every day I open can after can of cat food trying to find something she’ll eat, and I end up throwing out most of it because if it sits there for more than an hour or so she doesn’t want it anymore (same if the can’s been open for a while). I think most compassionate pet owners ask themselves that question at some point. Their beloved friend is getting old, maybe they have some health issues and they just don’t seem to have the same pep they used to. Are they just slowing down or are they in pain? How can we know the true extent of their suffering? We can’t, so we have to watch their behavior for changes that indicate they may not be feeling well, and trust our veterinarian to assess their health and be honest with us about their quality of life. Quality of life. It’s a term we use to assess our pet’s well-being and decide when and whether to help them by ending their suffering. It’s a subjective analysis because we all have different feelings about how much suffering is ‘œenough,’ and even whether it’s appropriate to intervene to end a pet’s life humanely. My approach to humane euthanasia has changed over my lifetime. 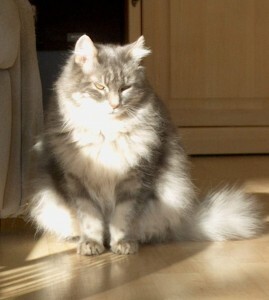 When I was 28 my cat, Snowflake, was diagnosed with kidney failure. He was 18 and I’d had him since I was ten. 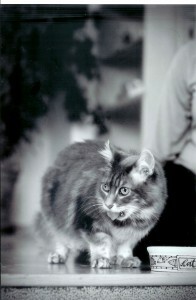 He was the first cat that my family adopted that was ‘œmine,’ so you can imagine how special he was to me. My veterinarian had to remind me that Snowflake was suffering. He suggested that we put him to sleep while he was still conscious enough to recognize me. I balled and balled and balled, for hours and for days. It was so hard to say goodbye. I’ve faced this decision many times since then, and while it never gets easier, it has become more clear to me when the time is right to let go. I don’t like to see my pets suffer, and I recognize that by holding on to them for one more day or week or month I’m being selfish. I’m the one who is going to feel the loss when they’re gone, and I don’t want to face that. Sometimes letting go is the kindest and most selfless acts of love you can give to your pet at the end of their life. Ophelia is still hanging in there. She’s a fighter, which is probably how she survived so long as a feral, despite her petite size. Sometimes I stop my busy-frantic-have-to-get-things-done running around and just sit on the couch so I can spend some time with her. Her motor starts running when I pet her gently, because of the arthritis and sometimes she starts to drool (did I mention that she had all her teeth removed due to gingivitis?). I want to spend as much quality time with her as I can, so that when the time comes I can let her go and we can both be at peace.